Dromcloc is situated just 4km from the historic market town of Bantry, and the renowned Sheep’s Head Way walking route passes its door. 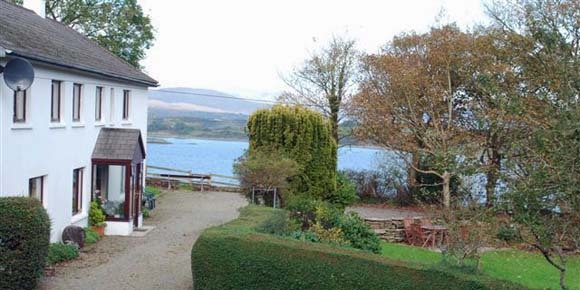 Dromcloc House overlooks Bantry Bay, and the sea views, with the Caha Mountains and Beara peninsula as a backdrop, are wonderful. A walk along the farm’s shoreline at sunset becomes a treasured memory for many of our guests. The B&B, where the Crowleys have lived for 5 generations, is surrounded by mature trees and a peaceful garden. Johnny will be delighted to share local stories with you, and to offer advice if you’re researching family histories in the area. You will be welcome to make use of Dromcloc’s private tennis court and our fishing and sailing boats during your stay. Boating trips, sea angling, golf,and pony trekking can all be arranged locally. We’ll offer you a warm welcome here at Dromcloc, and we’ll be happy to offer you advice on the best things to see and do while you enjoy a relaxed and peaceful holiday here on the Sheep’s Head peninsula. Rates: From €37.50 per person, per night. See here for more details.